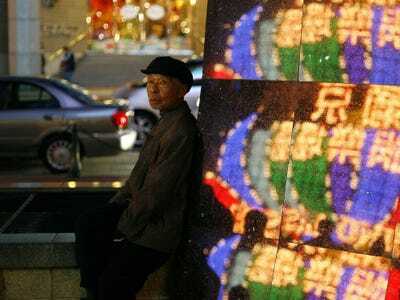 ReutersAn elderly man sits outside a casino reflecting Casino Lisboa owned by tycoon Stanley Ho opposite the street in Macau December 18, 2009, two days before the 10th anniversary of its handover to China. Total casino revenue on the Las Vegas fell 5.6% to $US520 million in October as high-rolling baccarat players from China stayed home fearing President Xi’s corruption drive. Baccarat winnings fell 36%. It’s worth noting that the people that can really make a difference in the high-roller market are few — maybe a couple hundred big time players from around the world — so when some (in this case, Chinese) players dip out, it makes a difference. And it’s a problem Macau has been trying to tackle since earlier this year, when a billion dollar heist changed the way VIP games are financed. Macau used to adhere to a junket system in which high-rollers use investor money to gamble, and investors were guaranteed 1%-2% returns. However, when one junket operator vanished with over a billion in junket cash, the whole system was disrupted and investors wanted higher returns. Xi’s corruption crackdown and China’s economic slow down exacerbated matters. This is a big admission for a Wall Street bank. For months analyst notes have been riddled with excuses — a smoking ban was hurting revenues, they said; the corruption drive was a minor issue, they said; middle class Chinese players would soon rescue Macau’s revenue etc. Xi is visiting Macau next month, which analysts are considering an additional headwind for gaming revenue. It’s like having your dad visit your frat house.